Online multiplayer is now synonymous with gaming — a medium that was previously an inherently individual experience has changed exponentially in the last couple generations of hardware. Online multiplayer has not only changed how games are played, but how they are made too — you only need to look at games that are now fully dependent on the player having an internet connection such as Destiny 2 to see just how far playing with others has come. Batman: Arkham Origins is seen by many as the adventure to forget among the caped crusader’s outings in the Arkham series. The game stands out in the tetralogy of console titles with its distinct lack of familiar voice actors and with few new mechanics. However, the game featured a story that matches and even exceeds the work by Rocksteady and also took the series online for the first and only time. The online component of Arkham Origins didn't conduct itself half-heartedly, instead the multiplayer differentiated itself by pitting three teams of players against each other to see who truly owns Gotham City. Two teams are the henchmen of both Joker and Bane respectively that battle for control points while Batman and Robin patrol the gargoyles atop the multiplayer maps and slowly pick off members of the two opposing sides. The rush of swooping down and performing an inverted takedown as one of the dynamic duo mixed with the need to constantly be alert as the machine gun welding goons creates a unique online experience that was incredibly overlooked at the time of release. When it was revealed that The Last of Us was going to have a multiplayer suite in addition to the incredible narrative driven single player, many were sceptical that Naughty Dog would throw in an uninspired team deathmatch-esque mode and call it a day. However, the multiplayer in The Last of Us surprised many by carrying over the feeling of desperation and scarcity present in the single player to a tee. The online here is tactical and incredibly violent. The two modes available only support eight players in total, but the action is incredibly tense, especially when you couple it with the Survivors mode that only gives players one life per round. The metagame from every round of multiplayer comes from the group of survivors that you have to take care of — winning matches results in more joining your group while losses can increase the chance of disease wiping out a ton. If you loose all your survivors all of the progression made in the online component is lost. The Last of Us online does something incredibly different with multiplayer and is as essential to play as the hailed single player. Jedi Academy offers some of the most frantic multiplayer in a galaxy far far away to date. The surprisingly deep character and lightsaber customisation options left each Jedi feeling unique when jumping ludicrous heights around each of the multiplayer maps. The number of players allowed in each game created a deluge of lightsaber clashes and force lighting all happening at once. The intensity of each match was brought up a notch with the ability to individually challenge opponents that removed other players from the equation and focused solely on two players battling it out to see who the force was stronger with. Both the original Left 4 Dead and its sequel are incredible cooperative multiplayer experiences that everyone should play. Both games are love letters to anyone with a remote interest in zombies. Each game comprises of several levels that allow up to four friends to get together, either on the couch or through a headset, and dismember zombies. Although there aren't any aspects about the playable characters that set them apart from each other in terms of play style, each has their own personality that pays homage to a ton of different stereotypes. Both games feature a varied selection of zombies for the players to fear. Whether it’s the Jockey catching you unaware and jumping on top of you or the sound of the Witch’s crying raising the hairs on your skin, all zombies give you reasons to fear them and approach taking them down in different ways. Left 4 Dead provides a multiplayer that is incredibly nuanced and requires a layer of thinking that can’t be said for a lot of other online experiences. Multiplayer was never something that Assassin’s Creed fans were crying out for, however Brotherhood showed that the series can bring an incredibly unique multiplayer experience to the table. The game justifies the existence of multiplayer by informing you that you are an Abstergo agent training to kill the Assassins in a simulation. The multiplayer puts the player in a map with a target to assassinate, what makes online so intense is that you are also someone else’s target. The player has to take advantage of the NPC’s roaming the map, many of which have the exact same character model as the player, to fool their assassin into stabbing the wrong person in the throat. The greatest thing about Assassin’s Creed: Brotherhood online is that the players who are the most patient and deliver kills in the most assassin like fashion get a ton more points than those who are spotted and have to give chase on rooftops to secure their kill. The emphasis on cramming the most amount of style in each kill rather than chasing the highest kill count keeps everyone from charging around the map as quickly as possible to nail their next target. Metal Gear Solid 4: Guns of the Patriots delivered an incredible conclusion to the story of Solid Snake, however the game also featured a robust multiplayer experience that combined the sneaking mechanics present in the single player campaign with the emphasis on communication with other team members to come out on top in a variety of game modes. The strong emphasis on character customisation, the unique currency to purchase weapons within matches and the ability to choose the soundtrack to accompany an awesome kill streak are just some of the reasons this multiplayer component was incredibly unique and gave players an excuse to keep playing long after the credits had rolled. Unfortunately, it is now impossible to go back and relive this particular classic online, however it needs to be remembered for everything it did right. Absolute mayhem. Those are two words that describe exactly what the online component of Grand Theft Auto IV is all about. 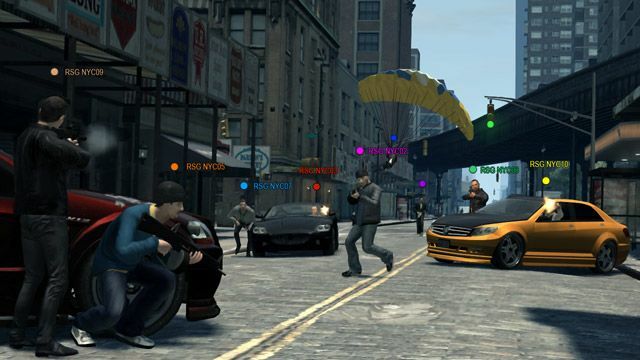 Grand Theft Auto IV laid the technical and thematic groundwork for GTA V by accomplishing the technical feat of allowing up to 16 players roam Liberty City together while causing an unfathomable amount of mayhem in their wake. The game offered a ton of different game modes for players to stretch their driving and RPG wielding muscles either with or against others. Grand Theft Auto IV was a turning point for the series and demonstrated that Rockstar can not only deliver an incredible single player experience, but they can also create an incredibly addictive online suite capable of bringing players together to create a deluge of chaos. Call of Duty 4: Modern Warfare seems to get all the credit for putting the Call of Duty series on the map and bringing the signature multiplayer modes with it. However, Call of Duty 2 is the original multiplayer king — the game delivers the same unparalleled feel and precision present in later Call of Duty games which stood the title head and shoulders above other shooters when it released back in 2005. Sure, you can’t sprint and the perk system is no where to be found, but Call of Duty 2 laid the foundation for one of the most popular multiplayer games of all time with a great set of maps and an incredible feeling first-person shooter that plays exactly how the genre intended it to be.